» Do i need a protection circuit for 24V AC solenoid? Do i need a protection circuit for 24V AC solenoid? Hey guys. I am driving a 24v AC solenoid with the use of a optotriac and a triac. Before i actually go ahead with this i would like to understand if i need to use a snubber circuit or diodes in some arrangement to protect the triac from high voltages produced by the solenoid when its magnetic field collapses. There is some confusion from my side because this is AC and i do not have lots of knowledge on AC at all. Then secondly there are many opinions on google where people say if its AC you do not need protection for ac unless the switching times are critical. In my case switching times are not critical so if i switch the solenoid on or off and it goes on or off after a second or so that is fine as long as it goes on or off. If i need a scrubber circuit (as i understand this is a capacitor and a resistor in parallel with the solenoid) what size capacitor and resistor do i need? also will the alternating current not destroy the capacitor when the polarity switches? i know that capacitors have a + and - side to them. or must i use a capacitor that is not sensitive to polarity? If i must use diodes how must they be arranged and which diodes can i use? I'll let others comment on the snubber question. I'll mention, however, that I think you have Opto leads 1 and 2 reversed. Thanks you have a good eye. The reason why they are reversed is because in DIP TRACE there is no optotriac parts that fit mine (pin wise) so i deliberately switched 1 with 2. Thank you for mentioning it though. How do you know which AC wire is active or neutral? 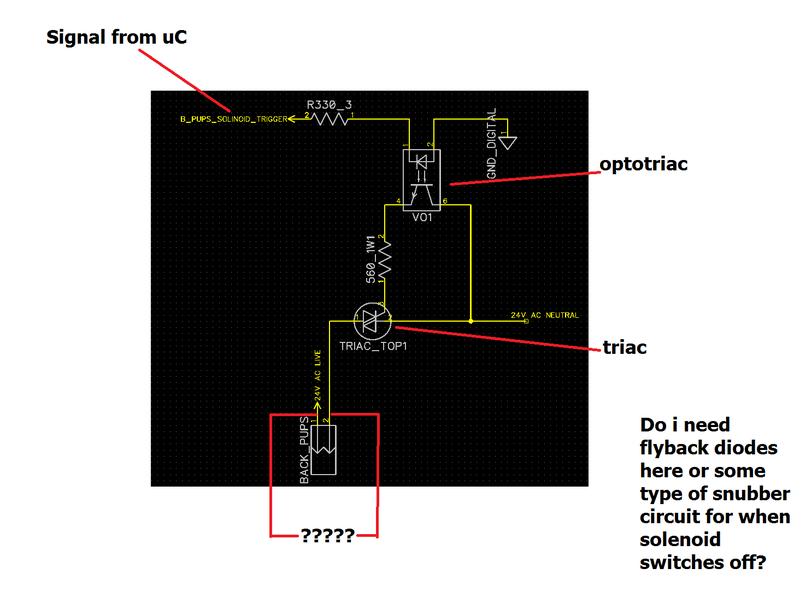 What optotriac are you using? What solenoid are you using? You can use a varistor ( voltage dependent resistor) and/or a rc snubber. What size varistor? We need more info to answer that. As for the snubber, 100nF and 100R is a start. The 100nF is usually a film capacitor and suitably rated. For mains voltage it would be X2 rated. Film capacitors don't have a polarity. Use the capacitive reactance equation to find how much current will flow through the capacitor at your voltage and frequency. If your load is in no way inductive (i.e. 100% resistive) or you are synchronizing the triac shutoff with the current ZERO-CROSSING, you're OK, otherwise you will want an AC snubber. Some triacs have zero-crossing shutoff built-in. Yes good question and i must be honest i have no idea? As i see it they are exactly the same? is this incorrect to say this? How would i know how much voltage i am dealing with? is this the voltage spike when the solenoid switches off you are referring to? if so how do i go about understanding this high voltage? As far as I know, by their construction, triacs start conducting when they are triggered and stop conducting by themselves when the load current falls below a predetermined threshold. So, there is no overvoltage at cutoff caused by an inductive load. Zero-crossing triacs start conducting when the voltage crosses 0 whenever they are triggered. That is a good way of driving capacitive load to avoid overcurrent. HWA : hardware abstraction for micro controllers, in pure standard C, without penalties. Well now i pretty confused if i should or shouldnt use a snubber circuit? it will probably be safe bet to just use one in anycase? Since you've given use some critical information, then the question becomes a lot clearer. Next time, don't waste everyone's time by making us guess. Active and neutral - yes they are different. Neutral is tied to earth at the MEN. This is for safety. Transformers have capacitance, so the secondary can float to half the primary voltage. You're using an optotriac that switches on zero crossing. Critical information. What solenoid - critical information. How much voltage are you dealing with? You said 24VAC. You made a simple problem more complex. Did you investigate capacitive reactance and how to calculate it? Did you learn anything? You want to learn remember? You'd use a mains rated capacitor if you were using mains voltage. A mylar capacitor is much cheaper. Opensprinkler uses a TVS, but he doesn't switch on zerocrossing. The real decider is to measure the circuit when it is in operation with an oscilloscope. Be sure your circuit can handle the fault currents that may occur. Remember the fuse is to protect the wire. I did read up on capacitive reactance. I used a excel spreadsheet to calculate examples but not for my problem as I don't know how to measure hendries of my solenoid. I am very confused as to what capacitor I must use. The voltage I am using is 24v ac. Must the capacitor be able to withstand the 24v ac or the back EMF created by the solenoid which might be in the hundreds of volts? What fault currents are u referring to and what fuses are u talking about? A mylar cap of 200V or so should be adequate. Note that the action of the capacitor limits the voltage excursion. The purpose of calculating the reactance is to calculate the current through the resistor and thus adequately determine the required wattage for the resistor. We don't want things to go up in smoke do we? Say one of your solenoid circuits goes short circuit - what limits the current? What will melt and catch fire? Your circuit? The wiring? The transformer? That's why we have fuses. A mylar cap of 200V or so should be adequate. Note that the action of the capacitor limits the voltage excursion. The purpose of calculating the reactance is to calculate the current through the resistor and thus adequately determine the required wattage for the resistor. We don't want things to go up in smoke do we? Say one of your solenoid circuits goes short circuit - what limits the current? What will melt and catch fire? Your circuit? The wiring? The transformer? That's why we have fuses. if i calculate the capacitive reactance for a 0.1uf capacitor at 60HZ i get a huge resistance? 1/(2*pi*f*C) = 1/(2*3.14*60*0.0000001) = 26 525 ohms. So almost no current will flow according to this resistance? Thanks for telling me i must use a fuse i would have left this out and possibly caused a fire. as for the size of fuse to use i do not know? My power supply is rated at 800mA. The solenoids use 200mA on continues use and im guessing somewhere around 700 or 800mA on initial startup. So if i use a 300mA fuse in series with the solenoid it will fuse once it starts. if i use a 800mA fuse it will not be able to fuse at all because my power supply cannot supply more current than this. if i use 700mA it might fuse on startup and if it doesnt then i will hope my power supply can actually supply above 700mA or else it also wont fuse? Please can you explain to me how the snubber circuit prevents the hundreds of volts that is produced by turning the solenoid off from damaging the triac? if the cap is only rated for 200v and the back EMF is 800 volts then i have a problem dont i? as for the size of fuse to use i do not know? Some googling and reading has made me come across "slow blow" fuses. This seams like it will work for this application. So if i get a 300mA slow blow fuse i should be good? as these can withstand transient currents etc. Mr KArtman may i please have some of your wisdom regarding this? If the reactance is 26k ohms, how much current flows through the 100 ohm resistor? How many Watts are disipated by the resistor. Your power supply is rated for 800mA continuous (unless is says otherwise). It can supply more current unless it has some form of current limiting. Good research on the slowblow or T rated fuse. If the back EMF is 800V peak with no load, then the voltage will be lower if we provide a load. The inductance can only store X amount of energy. Lots of volts in a short time or less volts over a longer time. The snubber provides a load, thus reducing the peak voltage. Again you can measure this with your oscilloscope. What? No oscilloscope? Does your pc have a soundcard? How does a capacitor reduce the voltage. A capacitor tries to stop the change of voltage across it. Thus the inductance will face a load trying to have the voltage across the capacitor change. Think of a cylinder of water and a plunger. You need to apply force to get the water out - especially if the outlet hole is small. If you image the inductance is a spring. Compress the spring and have it work against the plunger. The spring expands slower than if there was no load. A bit like an automatic door closer. If the reactance is 26k ohms, how much current flows through the 100 ohm resistor? is 26k ohm even correct? i mean did i calculate it correct? it barely makes sense because when a cap starts charging it behaves like a short circuit for instant it begins to charge. So then the resistance is "0" and lots of current will flow. So even though the frequency is relatively slow 60Hz the cap still charges and discharges and when it begins to charge it has "0" resistance. Now i thought about this for a long time and i just dont understand it? what does this 26k ohm say? You're taking a rather simple situation and making it rather complex. We get 24vac and pass it through a 100nF capacitor and 100r resistor. How much current will flow? If in doubt, build the circuit and measure it or there are simulation programs. Since it's AC we're talking about, the current is always changing, so what we measure is the average value or RMS. Also consider that we're dealing with AC, so you can't apply a DC mindset. You found out how to calculate the reactance, but what is reactance? This is for you to research. It's very fundamental. The three physical properties - resistance, capacitance and inductance. A piece of wire has all three. Thanks Kartman. i have been reading that link on AC you have posted. Its very technical so i am struggling to understand a lot of it especially the maths but i am reading it. So as i understand and from what you have explained is that the resistor experiences a whole range of currents but operates and behaves on the "average" it is subjected to. What simulation program would you recommend i use? Electronics IS technical. It took man a few hundred years to formulate his stuff, so don't expect to pick it up in seconds. You still haven't answered he question of how much current flows through the 100R resistor. You've calculated the reactance, so solve the problem like it is DC - a 26k and 100R in series. Or just get a 100nF cap, 100R resistor, 24VAC power and a multimeter that can measure AC. Does reality line up with theory? If you rectify your 24VAC and put it into a capacitor, what DC voltage would you expect to measure? As for a simulation program, I usually don't use them. I work with younger engineers that were bought up on them, so they get that work. I'm just the old grumpy know it all! I hear LTSpice is free and popular. how can it say that there will be 24V/26 000 ohm = 0.0009 A flowing through the resistor? Im not sure i understand the question but initially you will measure a very low voltage and as the cap charges it will go up to the 24v - 0.7v from the diode forward voltage? Ok, so what rating would the 100R resistor need to be? How hot would the resistor get? Your 24VAC is most likely 24VAC RMS. The peak voltage is 1.4142 times this. So the answer would be around 32VDC. It would generate 100*(0.0009*0.0009) = 0.00008 watts? Duparq has right. In this case any additional snubber isn't needed. Not for inductive load and not for that small power. Triac always switch itself off when current fall to almost zero. And too high current rising at switching the triac on is limited by load inductance. Furthermore, it is not recommended to turn on triac with inductive load at voltage zero crossing, because in that case the current transients are higher. Zero crossing turn on is for resistive load, to reduce EMI.